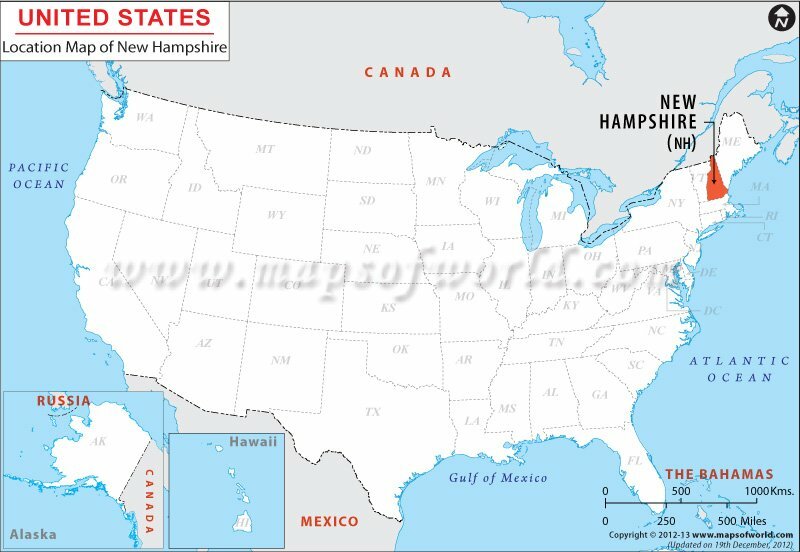 Where is New Hampshire located? Surrounded by Quebec of Canada on its north side, by Maine and the Atlantic Ocean on the east, by Massachusetts on its south side, and by Vermont and Quebec on the west, New Hampshire is within the coordinates 44.0° N, 71.50° W. The state encompasses total area of 14,933 square miles having total land area of 14,472 square miles and a total inland water area of 461 square miles. New Hampshire stretches 93 miles on its east-west boundary and 180 miles on its north-south boundary. The total length of the boundary of New Hampshire is 555 miles.